So back when Polaroid called it quits, I bought a lot of film directly from them. I bought mostly the peel-apart pack film: 669, 664, and 690. Back then, in 2008, I shot some of the 690 film and was dismayed to find out it was actually grid film. I had intentionally bought expired grid film before (in drug stores and on eBay) for the novelty of it, but only in the Spectra format. Basically grid film overlays a grid over the image, with labeled axes, so you can “name” a particular point on the image. I guess it was used primarily for crime scene documentation, but I can see that it would be useful for a lot of stuff. In fact, the film package included a guide to what the distance between grid lines was based on your distance to the subject. But this 690 grid film didn’t have that. 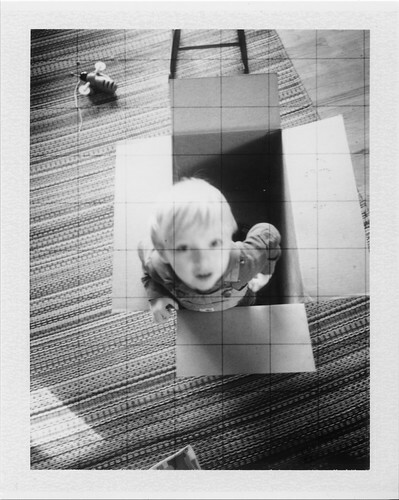 I was ticked off because I couldn’t really call Polaroid (now vanished) and exchange the film. I felt like the victim of a bait-and-switch. So fast-forward over two years to this past week. I have a Polaroid 650 SE, which is a variation on the Mamiya Press camera, with a Polaroid back. Mine came with a 75mm lens but without the special 75mm finder. The finder is a small lens that sits atop the camera and allows me to see what the film will see. This finder also supposedly features parallax compensation, which means that it adjusts its framing based on how near or far you’re focusing. I’m able to focus using the rangefinder mechanism of the camera, but I cannot frame the image correctly. I dusted the camera off and put a fresh pack of Fujifilm’s ISO3000 packfilm in it, in hopes that I could use a spare 21mm finder (for 35mm cameras) and figure out roughly how to frame a shot without hunting down an orphaned 75mm finder (they’re impossible to find without their lens, and I’d hate to buy an extra lens just to get the accessory finder). So I take my first shot, using a tripod, of some pots and pans hanging in the kitchen, with some gaffer tape ready so I can mark off what the field of view really is, according to the finished print. Then lo and behold, it’s that freakin’ grid again. Then something tapped at the corner of my brain. When I had loaded the film pack, I had made a mental note, though obviously with a very light pencil in a very dull and dark section of my brain. I had seen glass between the film back and the chamber of the camera, and I had seen wire in that glass. 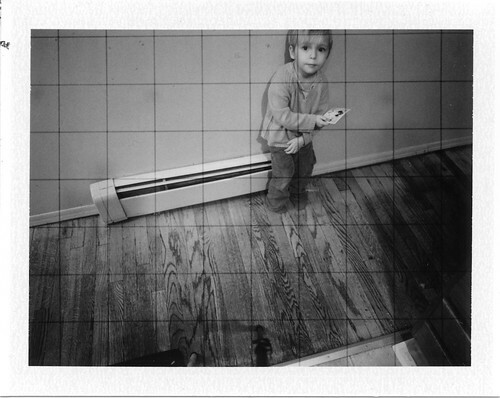 The grid was in the camera, not the film. The 690 film I had shot before, I had shot in this very camera. I was an idiot (still am, nothing’s changed). I pondered removing the glass (it’s glued in) but it’s a professional job and I might as well keep it or trade it away. Instead I’ve ordered a standard back for this system. But in my quest to make this work without spending any more money, I did come across something pretty cool that I’ll write about next.